An exhiliarating musical roller-coaster ride through the Major Arcana is how I would describe Réjean Paquin’s Tarot music. Sound effects and voices are woven into the 22 tracks which are a mixture of styles – from gentle ballads to pop tunes to cinema-style soundtracks. If you want a CD of ‘wallpaper’ music to play in the background at your next dinner party, this is not the CD for you. But if you want a musical interpretation of the energies of the Tarot cards, this is definitely the CD for you. Réjean’s Tarot takes you from the excitement of the Fool to the agonies of Death and the Tower, to the quiet, almost divine state of Judgement and the World, where you know you’ve reached your destination. This is music to listen to over and over again, music that reveals something new at every listening. The composer, Réjean Paquin, lives in Quebec Canada. At the age of 19 – inspired by his brother who published a Tarot deck in 1979 – Réjean embarked on an epic journey to compose music for the Tarot. As so often happens in life, the journey took longer than expected – in Réjean’s case 26 years! Along the way, he played in bands, studied musical composition, contributed to musicals, rock operas and film soundtracks. Shortly after the CD was launched, I spoke to Réjean about Tarot. LM: Do you have a favourite track? LM: With the galloping horses – why is that track your favourite? RP: The sound effects of the horses galloping from right to left seem to me to capture the essence of the charioteer keeping the sphinxes from charging off – either to the right or to the left. And it’s one of the more dynamic tracks – I can see Charlton Heston charging along in his chariot in that fabulous race in Ben Hur. LM: What about the creative process itself – any stories there? RP: Maybe the World…one night I was dreaming and heard that song. I woke up in the middle of the night and wrote the melody out on paper. I then built the piece with different tracks. I used musical phrases from a young child singing on samples called ‘Indian Traditions’. The World is now the single for the CD. LM: Tell me about the different styles of music in the collection. RP: There are ballads, for example, the Empress and the Lovers. Other tracks, like Justice, the Chariot and the Devil, are really ‘poppy’. Then there’s theatrical or cinematic-style music with sound effects. The Emperor is a good example of these. Mixed into the music you hear German soldiers marching and speeches by Roosevelt – the sound effects help to convey the themes of power and authority that I associate with the Emperor. LM: I really like the way you’ve used sound effects – an added dimension to your musical interpretation of the cards. RP: Yes, the starting point for those tracks was the sound effect. Take Death, for example. I recorded some voices, then I put them in reverse to suggest the idea of watching the film of your life rewinding as you go through a period of transition. At the end of the track, the voices are back to normal, suggesting that you’ve reincarnated. In the Wheel of Fortune, I use the sounds of a casino, of a roulette wheel and in the Hanged Man there’s a clock ticking. In Justice you hear the judge saying “over-ruled” and it ends with the sounds of a circus or fairground – there I’m using the music for my own personal comment on the justice system! LM: You say you started on the epic journey of composing this music 26 years ago. But when did you actually start writing the music? RP: I wrote the first tracks in 1997 – the Lovers, the Fool and the Emperor. The Lovers was the very first track and it’s the only one I didn’t change along the way. The music is a simple ballad style – no words, no sound effects. The whole process was slow, because at that time I wasn’t ready to produce the album, I had more life to live and, in a sense, I had to wait for the technology to come along to help me realise my vision. LM: Last but not least – the cover! What’s the significance of the metal nut? This is a very different sort of image for Tarot – not at all ‘new age-ish’. RP: Aha! I didn’t want a cover that was ‘new-agey’ with angels and stuff – I wanted a symbol, something unique and something industrial. In French Quebec slang the word ‘Taraud’ (pronounced the same as ‘Tarot’) means a ‘nut’ that you screw onto a bolt, and that’s the image I decided to use. It’s a circle, so it symbolises the cycle of life. LM: You could also see it as a symbol for putting everything together – Tarot is about the nuts and bolts of life! RP: Yes, I hadn’t thought of it like that! Review by Linda Marson, first published in 2005 in The Magician, the newsletter published by the Tarot Guild of Australia. 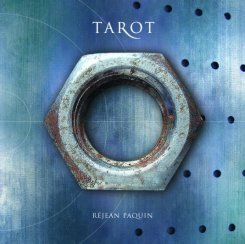 Click here to listen to sample tracks from Réjean’s Tarot album and to purchase the CD.